Learn how to make the best ever healthy crunchy chocolate chip cookies from scratch! They have no eggs, refined flour or sugar and just 100 calories! My family raves about these—and they always disappear in the blink of an eye! A few years ago, my mom, my brother, and I traveled to Arizona the weekend before Thanksgiving to see my grandparents. We woke up early on Saturday morning to navigate through the crowded airport and catch the only nonstop Southwest flight from the Bay Area to Tucson. After landing, we picked up a rental car and drove over an hour to my grandparents’ house in their small town. Once we had dropped off our bags in their guest bedrooms, we spent the rest of the day visiting, doing chores, and running errands for them, thoroughly enjoying every minute of quality time. That evening after dinner, the three of us felt slightly exhausted from our long day of travel and nonstop activities in Arizona, so we collapsed on the sofa and armchairs in the living room to relax. I noticed a tub of bite-sized crunchy chocolate chip cookies from Trader Joe’s on the kitchen counter, and after checking with my family, I grabbed three little ones, put them on a napkin, and slowly nibbled on them while unwinding and talking with Mom. Although I normally vastly prefer soft and chewy cookies over crunchy ones, I completely surprised myself by how much I loved those cookies from Trader Joe’s… And I even went back to the kitchen for a couple more that night, in addition to nibbling on them again the following evening after dinner too. Yet when we returned home, I purposely avoided buying a tub at the Trader Joe’s in my California town… I knew I’d polish them off all by myself much too quickly! After visiting my grandparents in December and again last weekend, I decided to try baking a batch of crunchy cookies in my own kitchen. After lots of testing and tweaking, I finally perfected this recipe for the Ultimate Healthy Crunchy Chocolate Chip Cookies! 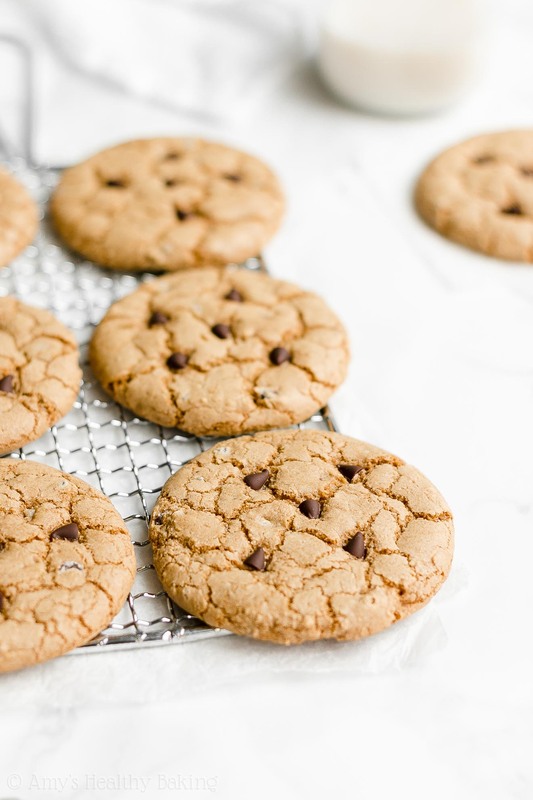 They’re crisp and crunchy, not one bit soft or chewy like my other ultimate healthy chocolate chip cookie recipe, and they’re deliciously sweet with lots of rich chocolate morsels. Yet unlike the ones I ate in Arizona, these contain no eggs, refined flour or sugar and just 100 calories! 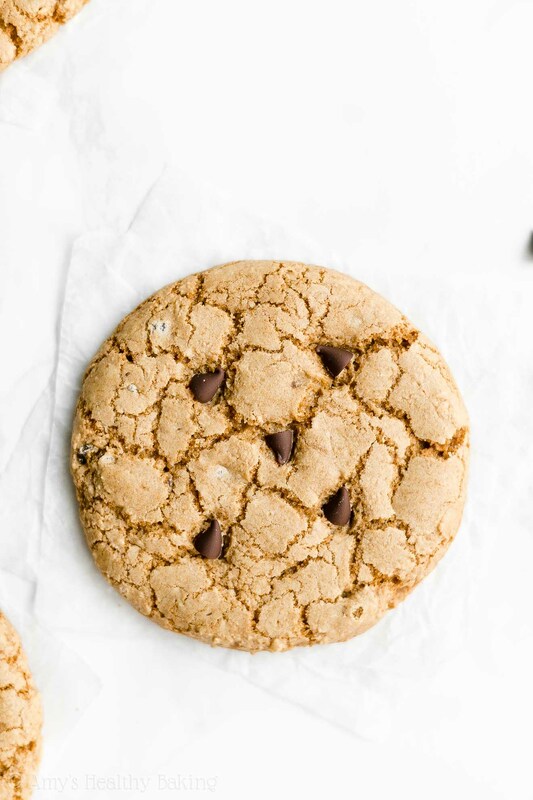 Let’s go over how to make these ultimate healthy crunchy chocolate chip cookies! 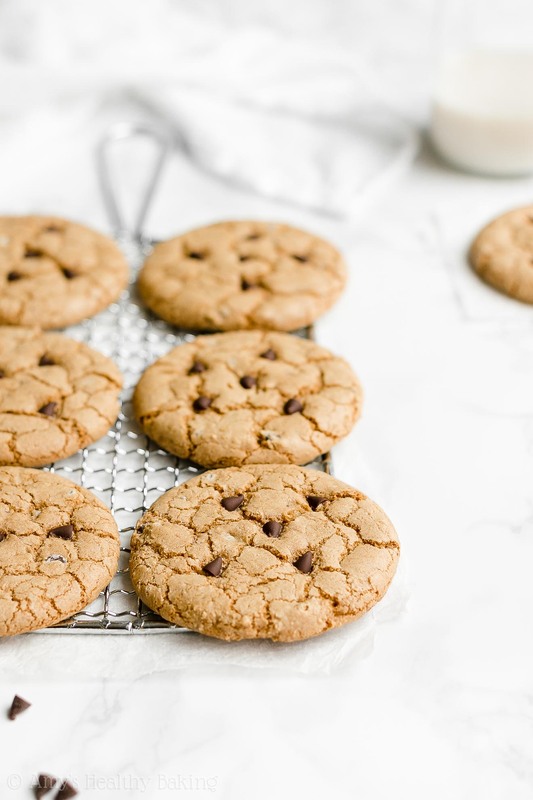 Because I learned a lot about the science of crunchy chocolate chip cookies while developing this recipe, I’m going to share lots of tips with you to ensure your batches turn out perfectly too! 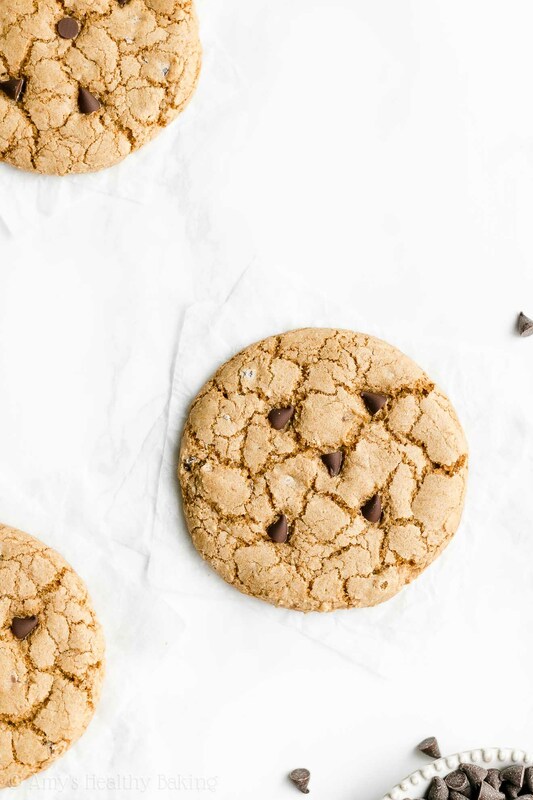 To make these crunchy chocolate chip cookies healthy, you’ll skip the refined all-purpose flour and use white whole wheat flour instead. Yes, such a thing actually exists… And it’s not a combination of white (aka all-purpose) flour and whole wheat flour! Instead, white whole wheat flour is made by finely grinding a special type of soft white wheat (hence the name! ), whereas regular whole wheat flour comes from a heartier variety of red wheat. They have the same health benefits (like extra fiber! 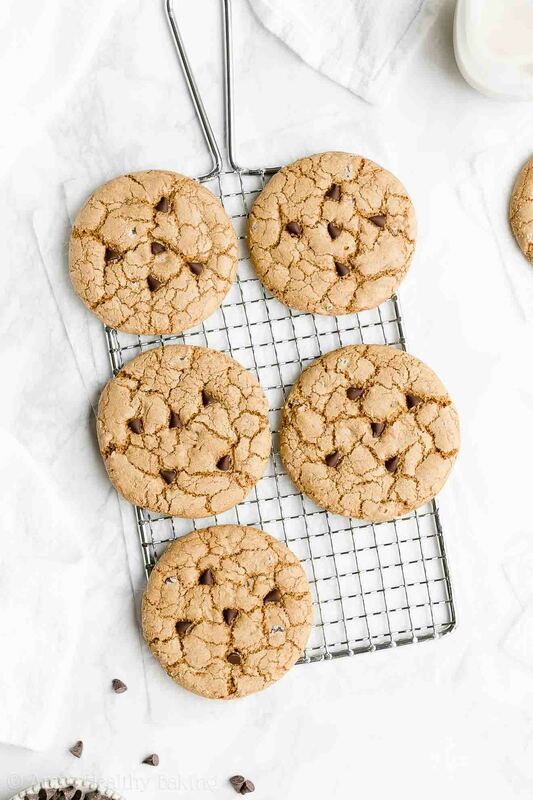 ), but white whole wheat flour has a lighter taste and texture… Which lets the sweet flavor of your ultimate healthy crunchy chocolate chip cookies really shine! 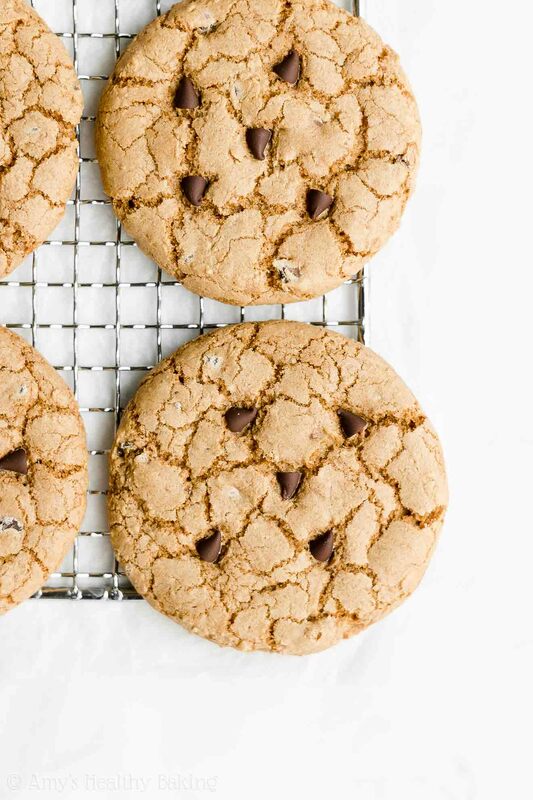 Your ultimate healthy crunchy chocolate chip cookies do require butter… But only 2 tablespoons! Compared to traditional recipes with ¼ to ½ cup, that really helps keep these healthy cookies low fat and low calorie. Plus I have a secret trick (see Nerd Alert #5!) that still makes these ultimate healthy crunchy chocolate chip cookies taste just as rich and buttery as traditional recipes! After lots of testing, I found that softened butter performed better than melted butter. I generally prefer melted butter because it’s so much easier to melt butter than remember to set butter out far enough in advance to soften… And using melted butter means I don’t have to pull out (and then wash) my mixer… But the softened butter truly gave these cookies a crunchier texture. You’ll beat the softened butter with coconut sugar! This creaming method (instead of stirring, like with melted butter!) whips air into the cookie dough. Less air pockets = softer and chewier texture. More air pockets = crunchier texture. And since you’re making the ultimate healthy crunchy chocolate chip cookies, creaming the butter and coconut sugar is the way to go! Coconut sugar is exactly what it sounds like, an unrefined sweetener that comes from coconuts. However, it doesn’t actually taste like coconuts! 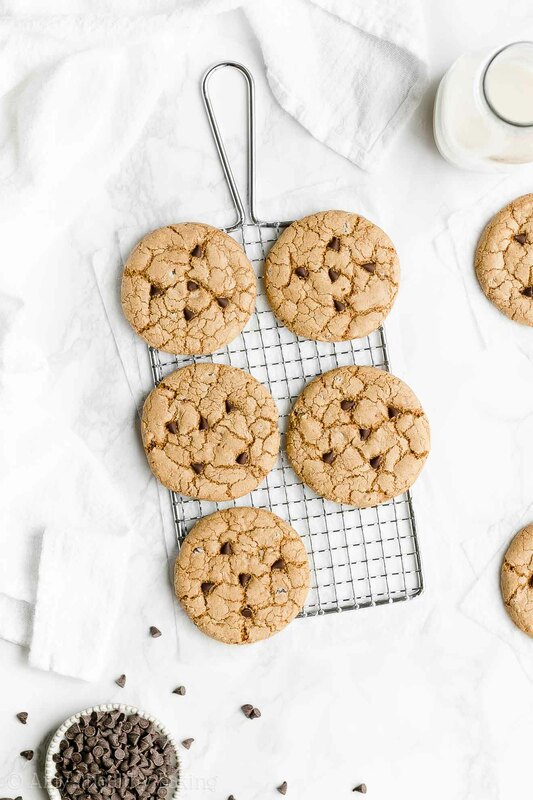 It has a caramel-like flavor, similar to brown sugar, that makes these ultimate healthy crunchy chocolate chip cookies taste deliciously rich. If you’ve read every word of my blog post so far, then you already know… This recipe requires no eggs! Eggs, especially the yolks, create a more soft and chewy texture in cookies. Therefore, by omitting the eggs, your cookies have a less soft or chewy and more crunchy texture. Instead of eggs, you’ll add a little splash of milk to your cookie dough! Any kind will work, but since my brother is allergic to eggs and lactose-intolerant, I prefer using unsweetened cashew milk or unsweetened almond milk so he can enjoy these cookies too. And in case you’re wondering, he gave these ultimate healthy crunchy chocolate chip cookies his big stamp of approval! Vanilla is a very common ingredient in traditional chocolate chip cookie recipes, but it’s actually my secret ingredient because… You’re using more! 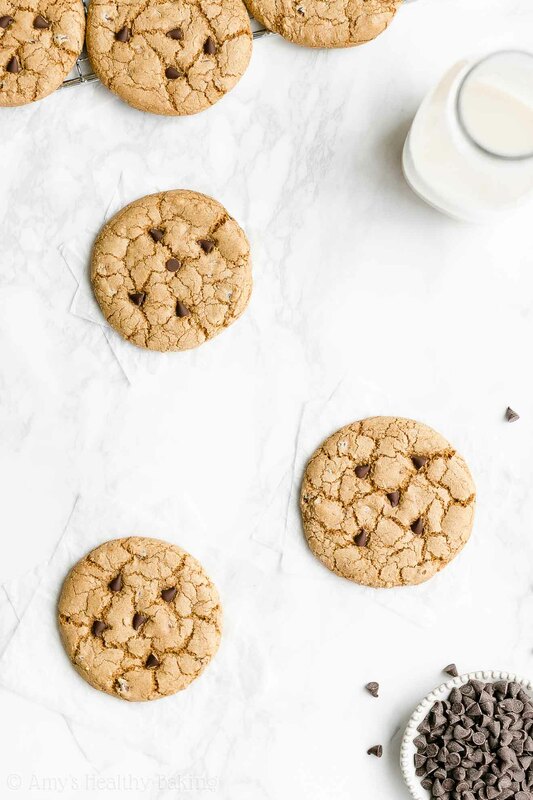 Extra vanilla extract actually enhances butter’s flavor, so using a bit more compared to classic recipes makes your ultimate healthy crunchy chocolate chip cookies taste just as rich and buttery as the traditional indulgent ones! They’re definitely a requirement in chocolate chip cookies! ? I tried using a blend of dark chocolate chips and miniature chocolate chips, like in my soft and chewy version, yet I found that my taste testers didn’t enjoy the big chocolate chunks as much in this crunchy version. So I stuck with solely mini chocolate chips. And that’s totally fine by me! It means one less ingredient to worry about… And multiple mini morsels in every bite! However, just like in my soft and chewy recipe, I saved some of the mini chocolate chips to press into the tops of the cookie dough just before baking. I think it makes these ultimate healthy crunchy chocolate chip cookies look even more irresistible, don’t you?? But wait… I’m getting ahead of myself! Chilling is mandatory! If you’ve measured your flour correctly, using this method or a kitchen scale (← that’s the one I own and love! ), then your cookie dough should be sticky when you first mix it together. Chilling helps stiffen the cookie dough, and it also gives the flavors a chance to meld. You just need 30 minutes! Long enough to check email, walk your dog, scroll through Instagram, realize seeing everyone’s food pictures on Instagram is making you hungry… Or is that just me? ? 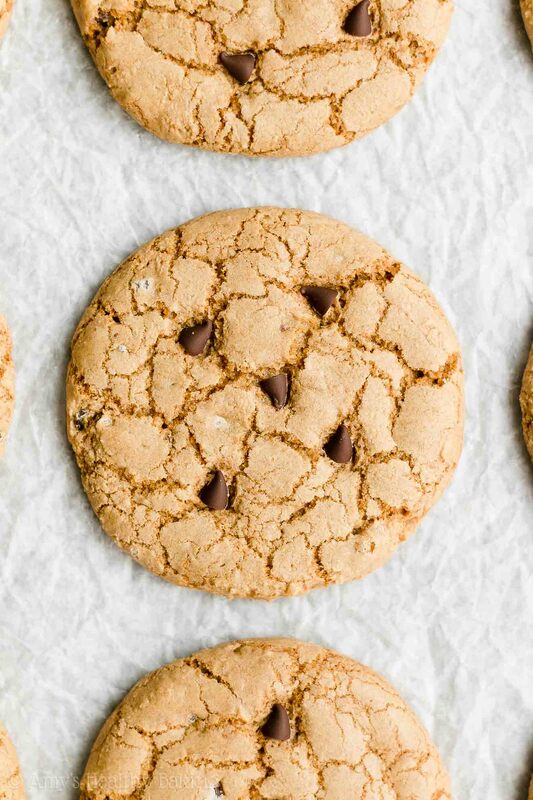 Your ultimate healthy crunchy chocolate chip cookies should spread some while baking (if you’ve measured the flour correctly, just like I mentioned before! ), but not excessively, so flattening the cookie dough before baking gives them a “spreading head start.” This is also the time where I press those reserved mini chocolate chips into the top of each cookie! You’ll bake these longer than with my soft and chewy version. More time in the oven = crispier and crunchier cookies. This extra time in the oven gives them a darker tan color, and that’s good! 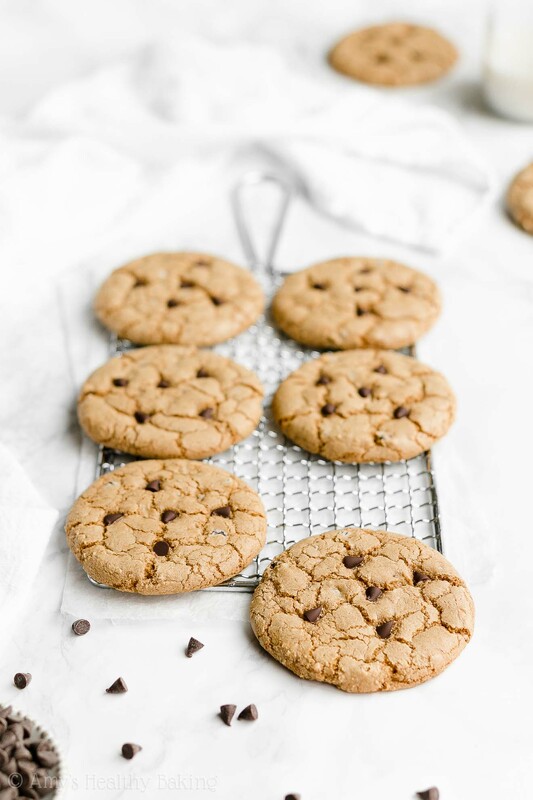 For the best texture, you must allow your ultimate healthy crunchy chocolate chip cookies cool completely to room temperature on the baking sheet! The warmth from the metal pan continues to cook the centers all the way through (without burning your cookies, like if you baked them longer!). If you remove them from the baking sheet too early, the centers of your cookies will be slightly chewy and not 100% crunchy. But I promise these are worth it! And when you make your own, remember to snap a picture and share it on Instagram using #amyshealthybaking and tagging @amyshealthybaking IN the photo itself! (That guarantees I’ll see your picture! ?) I’d love to see your ultimate healthy crunchy chocolate chip cookies! In a medium bowl, whisk together the flour, baking soda, and salt. In a separate bowl, beat the butter and coconut sugar with an electric or stand mixer. Beat in the cashew milk and vanilla. Gradually beat in the flour mixture, mixing just until incorporated. Fold in 2 ½ tablespoons of miniature chocolate chips. Chill the cookie dough for 30 minutes. Preheat the oven to 350°F, and line a baking sheet with a silicone baking mat or parchment paper. Drop the cookie dough onto the prepared baking sheet using a spoon and a spatula. Flatten to ½” thick using a spatula. (The cookies should spread some if there isn’t too much flour in the dough!) Gently press the remaining miniature chocolate chips into the tops. Bake at 350°F for 20-22 minutes. Cool completely to room temperature on the baking sheet. Notes: Whole wheat pastry flour, regular whole wheat flour, or all-purpose flour may be substituted for the white whole wheat flour. Oat flour will also work, but be extra careful when measuring it! For the gluten-free option, I recommend the following: ¼ cup (30g) millet flour, ¼ cup (30g) tapioca flour, 3 tablespoons (21g) coconut flour, and ½ teaspoon xanthan gum. Many store-bought gluten-free flour blends (like this one!) will work as well, if measured like this. It’s extremely important to measure the flour correctly, using this method or a kitchen scale. (← That’s the one I own and love!) 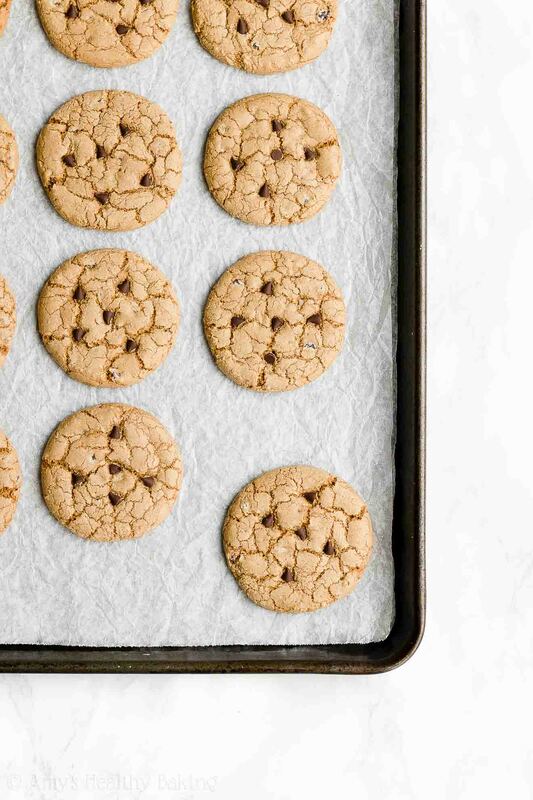 Too much flour will make your cookies turn out dry or crumbly. Light brown sugar may be substituted for the coconut sugar. Any milk may be substituted for the unsweetened cashew milk. For a vegan version, use vegan butter, like Earth Balance sticks (my favorite!) and vegan-friendly miniature chocolate chips, like Enjoy Life. I do not recommend substituting coconut oil because its melting temperature is much lower, which negatively affects the texture of these cookies. This recipe is easily doubled! If you prefer cookies that are crunchy on the outside and slightly chewy in the center, bake the cookies for 15-18 minutes instead. For more information, please see the Nerd Alerts #1-9 in the blog post above. 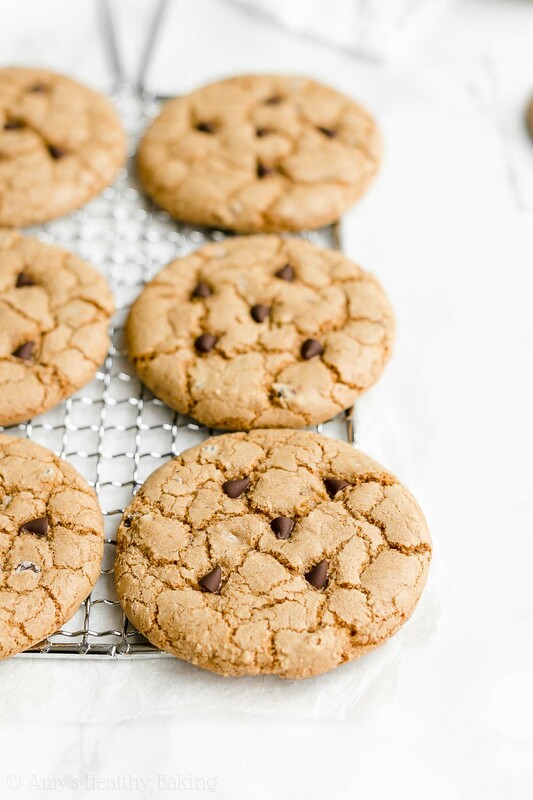 ♡ …and the rest of Amy’s healthy cookie recipes! I think this recipe looks great, I wish you’d provide the nutritional information along with it. I’m trying to find some low carb cookie recipes and almost every recipe I look at out on the web doesn’t include this information. I really appreciate your interest in my recipe Charles! The full nutrition information is actually included already; it’s directly beneath the recipe. I know it can be easy to miss! 🙂 I’d love to hear what you think if you try these cookies! Im glad you now have a crunchy cookie that I love more than soft this will be a great plain cookie without the chocolate chips that I can play around with and convert into my favourite New Zealand biscuits eg Hokey Pokey and gingernut biscuits here in NZ we call cookies biscuits where I think your term for biscuits is our scone, I grind my own flour so maybe if I sift out the bran it will be more like your white whole wheat flour? I just made these cookies and I really like it ? My dough was drier though and because of that I didn’t refrigerate it. I used regular all wheat flour and brown sugar instead. Plus about 1/4 cup of chocolate chunks. Yummy!! Hi, will reducing the amount of sugar rukn the crunchiness? We prefer less sweet. The recipe looks awesome otherwise, was thinking of adding some orange zest, might be interesting. Thanks! Thanks for your reply! I’ll try to experiment a bit then, most home made cookies turn out chewy, so I was looking for a crunchy cookie. Fingers crossed! Hi Amy.Would this recipe still work if i used oat flour and reduced the sugar to 1/4 cup? I really appreciate your interest in my recipe Renae! Yes, oat flour will work. However, reducing the sugar will not. The sugar isn’t just there for sweetness — it’s also there for texture! If you cut the sugar in half, then the cookie dough would be much too dry, and all of the flour wouldn’t get incorporated. I’d love to hear what you think if you try these cookies! I tried 2 recipes from you site but none turned out successful so far. I really appreciate your interest in my recipes Candy! That sounds really disappointing and not like how these cookies are supposed to turn out at all. I’d love to help you solve those issues! 🙂 How are you measuring the flour? Are you using a kitchen scale or measuring cups? If the latter, can you describe in detail how you used them? Also, did you make any modifications to the recipe, including those listed in the Notes section? Once I have all of that information, we should have a better idea of what happened and how to fix it!